Auckland Zoo’s staff said that the gibbon had serious, on-going welfare issues before he was put down on Tuesday. Iwani had been a frequent guest on a popular TV show called “The Zoo,” and had been hand-reared after his mother rejected both him and his twin sister just six weeks after their birth. His sister couldn’t survive the rejection, but Iwani managed to thrive for 11 years. According to zoo keepers, however, Iwani failed to identify himself as a siamang because he was raised by humans. When they introduced a potential partner to Iwani, with whom he was supposed to mate for life, he struggled to bond with her. “He never engaged with that behaviour with his female partner, Kera,” Kevin Buley, Auckland Zoo’s head of Life Sciences, told News 3, Auckland. Siamangs can live up to 50 years when raised in captivity, despite originally coming from the rainforests of Malaysia, Thailand and Sumatra. The tailless, black, furry primates are the largest gibbons of all, reaching 1m in height and weighing up to 14kg. They also have the loudest gibbon calls, aided by a throat sac that can inflate to the size of their head. 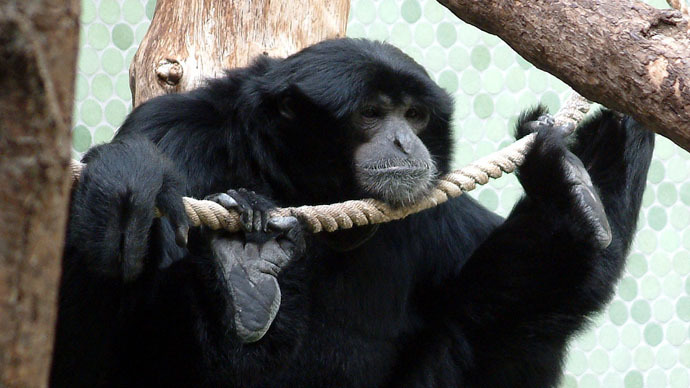 Keepers knew Iwani was unhappy and agitated, mostly because of how he would go to the viewing window at the zoo and call loudly – unnatural behavior for a siamang. His call could be heard at homes and parks near the zoo. His keepers tried for years to help Iwani, exhausting all possible remedies. “We would never have been able to satisfy his welfare needs,” Buley told News 3. Staff were heartbroken by the primate’s passing – a decision they did not take lightly.